Hyperlocal mobile commerce startup LazyLad is in advanced talks to raise up to $2.5 million (Rs 17 crore) and has received hard commitment from some investors for pitching in with almost half that sum, a person closely involved with the fundraising process told Techcircle.in. This person, who requested anonymity as he is not supposed to talk to media, said the firm has secured about $1 million in hard commitment from Japanese investors and is looking to close the targeted sum by May. "LazyLad may also look to raise multiple tranches as part of its Series A round," he added. When contacted, Saurabh Singla, CEO of Gurgaon based Angular Technologies Pvt Ltd, that operates LazyLad, acknowledged that the firm is in talks to raise Series A funding round. However, he refused to divulge further details. "We are looking to secure our Series-A round within two months," said Singla. In July last year, LazyLad raised $500,000 (Rs 3.18 crore then) in its pre-Series A round of funding from Tekton Ventures' founder and managing partner Jai Choi, Japan-based Sugashita Partners' Kiyohiro Sugashita and Japanese venture capitalist Hirokazu who invested in their individual capacities. It could not be ascertained if only these existing investors have agreed to participate in the fresh funding or it will rope in some new Japanese investors. LazyLad was the first startup under Green House Ventures' (GHV) accelerator programme. It raised about $100,000 in the seed round from GHV. It had also got on-boarded Sharad Sharma of iSPIRT in an advisory role. 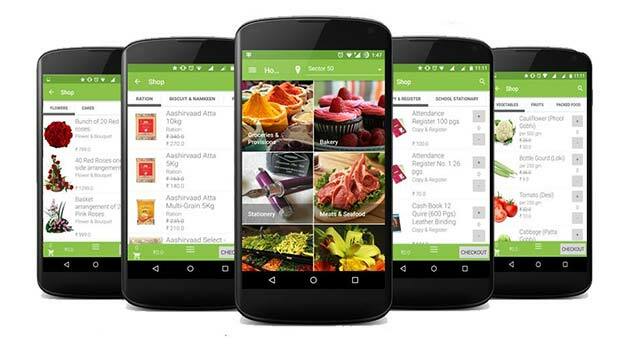 Founded in April 2015 by IITian's Saurabh Singla, Paresh Goel and Ajay Sethi, LazyLad's app gives access to neighbourhood retailers in six product categories that include flowers, daily groceries, fruits & vegetables, stationery bakery & confectionery items and meats & seafood. In some of the cities, it also offers books. The app is available for Android and iOS users. LazyLad hopes to introduce 70 categories, including home services by the end of this year. But it faces a big challenge in a market where heavily funded peers Grofers and PepperTap among others are trying to make a mark against the biggest online grocer BigBasket. LazyLad's services are currently available in Gurgaon, Chandigarh, Sirsa, Roorkee, Mohali, Panchkula and Zirakpur. The company hopes to add 25 cities by the end of 2016 and is targeting rest of Delhi NCR and Bangalore as the next two immediate port of calls. The startup claims to have more than 3,000 retailers on its network and hopes to bring this number to one lakh aggregated retailers by the end of 2016. According to Singla, the company has registered a 140 per cent growth month-on-month over the last three-four months, in terms of bringing retailers on its platform. LazyLad claims currently it facilitates 700 orders per day. It has also deployed its proprietary real time inventory management platform to the retailers on its network. Currently, a little over 10 per cent of its retailers use it. "A typical kirana store has 20,000-80,000 SKUs (stock keeping units). Tracking inventory in real time is major problem in the FMCG space," said Singla. "We will achieve operational breakeven within six months," said Singla. The firm has multiple revenue streams: it charges a flat commission of Rs 3 per order irrespective of the ticket size of the order, provides an advertising tool for FMCG firms besides lead charges from the vendors on its network. It is also in talks with FMCG firms to offer its data analytics service.